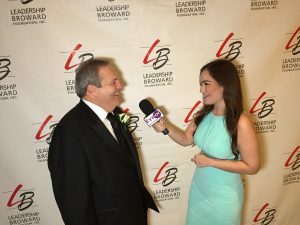 Richard Berkowitz, CEO of Berkowitz Pollack Brant, had a vision 35 years ago of a firm that would hire talented people and create an environment for them to build outstanding careers. Today the firm he founded continues to operate on these principles which have led to its success. Under his guidance, the firm has grown into a top 100 accounting and advisory firm and one of the largest in Florida. Kim Paucek Haley is owner and inventor of Medebra, which is a patented, innovative, multipurpose post-surgical bra/vest and mastectomy kit. As a cancer survivor herself, Haley set out on a passionate and divine-intervention fueled mission to create a long-overdue change needed and the first post-surgical clinical bra. Karan Munuswamy M.D., part of the Holy Cross Medical Group, is dedicated to medical research and public health education. He is an affiliated assistant professor at University of Miami School of Medicine and is actively involved in clinical research at the Jim Moran Heart and Vascular Research Institute and has contributed numerous articles in scientific journals. Roy Ripak is regional vice president for the Walgreen Company and supervises 340 stores, 17 Walgreen Clinics and 7 on-site pharmacies in South Florida. A 40-year veteran of the Walgreen Company, Ripak joined the company in 1974 as a stock boy in New York. He has held the position of store manager, district manager and now regional vice president. For the past 10 years, Ripak has had similar roles in Walgreen locations along Florida’s west coast and in Denver. George Taylor is an attorney at Brinkley Morgan. His practice focuses on solving legal problems arising from commercial business relationships, including the litigation of those matters in both state and federal courts. He also practices in the area of probate litigation, where he resolves disputes that arise in the context of estate litigation. He is also an active member of the community and serves on the boards of ARC Broward and Salah Foundation. Josie Bacallao is President/CEO of Hispanic Unity of Florida (HUF), a 34 year-old not-for-profit which serves 17,000 individuals annually from more than 25 countries, in four languages. Their agency’s key program areas are: Education, Economic Development and Civic Engagement. Bacallao is a board member of CareerSource, Greater Fort Lauderdale Alliance and the Greater Fort Lauderdale Chamber of Commerce. James M. Gress is executive director of Covenant House Florida. Under Gress’ leadership, Covenant House Florida today reaches nearly 200 youth per day in Fort Lauderdale and Orlando through street outreach, crisis shelters and transitional housing projects, making it one of the largest agencies serving runaway youth in Florida. The black tie gala, which is themed Once Upon A Time, is co-chaired by Penelope Blair, U.S. Trust/Bank of America; Ellice Martinez, Broward College; Maria Pierson, Pierson Grant Public Relations; Mary Lou Ruderman, Ruderman and Company CPAs; and Cindy Schutt, Schutt PR. Shelly Bradshaw, Broward Center for the Performing Arts, is the Foundation’s Vice President of Special Events and will be working with the co-chairs, along with Patty Sacco, Associate Director Resource Development/Special Events at Leadership Broward Foundation, Inc.
Sponsors, in addition to Hyatt Regency Pier Sixty-Six and Cato Insurance Group, include: Walgreens, Chen Moore & Associates, Azamara Club Cruises, Memorial Healthcare System, Berkowitz Development Group, Inc., Broward College, Alpine Jaguar, Berkowitz Pollack Brant, The Salah Foundation, Cindy Schutt PR, JM Family Enterprises, U.S. Trust – Bank of America, Ruderman and Company, CPAs, Holy Cross Hospital, Tripp Scott, P.A. Hispanic Unity of Florida, BankUnited, MedeBra, Harry T. Mangurian, Jr. Foundation, Broward Center for the Performing Arts, VITAS Healthcare, Stonegate Bank and Gray Robinson Attorneys at Law.